Do you know the feeling that you find the perfect color for your lips? But when your wear it you think mmm maybe it will be better if the color was lighter of when there was more blue in. Or that you can’t find the perfect color to match your outfit… yes, I know the struggles! So a little time ago I was looking after some new beauty products (because I love to shop 😉 ). And till my big surprise I saw something very interesting… Namely mix & match lipgloss. I saw five promising colors namely; black, blue, red, yellow and white. I bought the red, blue and white version. But why exactly these colors? As you maybe know are blue, red and yellow the primary colors. Just with these three colors you can make so much different variations! And the white and black one are of course to make your colors darker or lighter. Very clever essence! Because with these 5 colors you can make endless of variations. But I wasn’t that interested in the black and yellow one. But with the three color I have I can also make many kinds of colors! Time of a review! I have a love and hate relationship with blue on my lips. But keep in mind that the idea behind these lip glosses is that you self can create your own perfect color. I will show you the color just like this and also mixt. But there are much more variation to make! It depends from how much from each color you use. It’s a special bright blue color! I never saw a blue lip color like this before! Very special and also perfect to create an awesome look. The white color is also hard to bring on fully covered. So I only can recommend this one to make the gloss colors lighter. Like here! I really love this pink color! I don’t like pink lips on me, but this one I love! I just added a bit of white to the red color and bammm this pretty pink color appeared! Hell to the yes this color is indeed fired up! I love this glossy perfect red color! Yeees, also perfect to just wear it like this! I mixed the red one with blue. Dependent from how much you will use from each color you will get a purple color. The color I get was a very special, a bit a mystic, dark purple gloss! Very special! So my thoughts about these glosses? I’m very happy with them! They are perfect to create a unique lipgloss color! You can create so much variation with one a few glosses. So yes I really love the idea and how they look! They are fine to apply on the lips. The pigmentation is fantastic! And the glosses will survive a little drink but after a snack almost whole the color is gone. But hey, what else did I expect it are still lipglosses. So I find the mix & match glosses for sure so much fun to experiment with! And I’m pretty sure that now I will use them more to create that unique color! 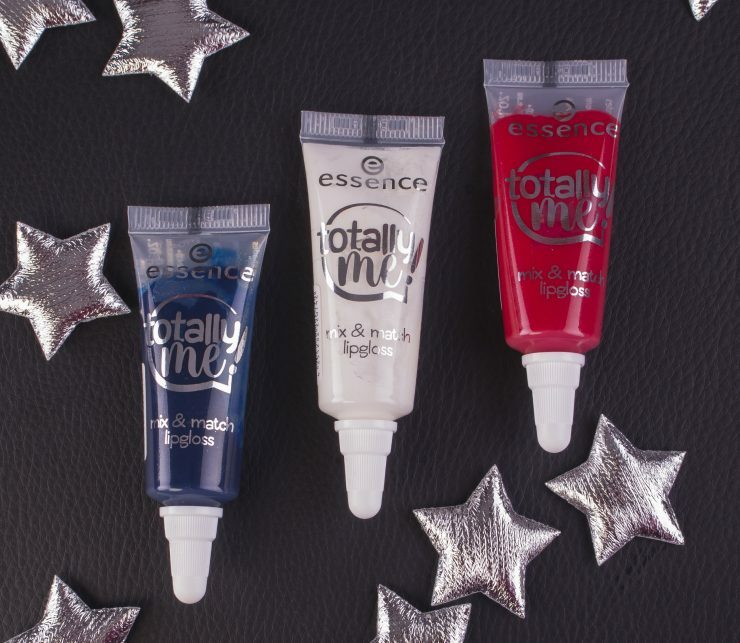 You can find these totally me mix & match lipgloss in the drugstore. The price is €1,99 for 10ml. Wat grappig om zo al die gemengde kleuren te zien! Het is dat ik niet zo van lipgloss houd, want dat mixen vind ik dan wel weer interessant. Oh wat heb je er leuke combinaties mee gemaakt!